California-Italian wines rooted in the Livermore Valley. 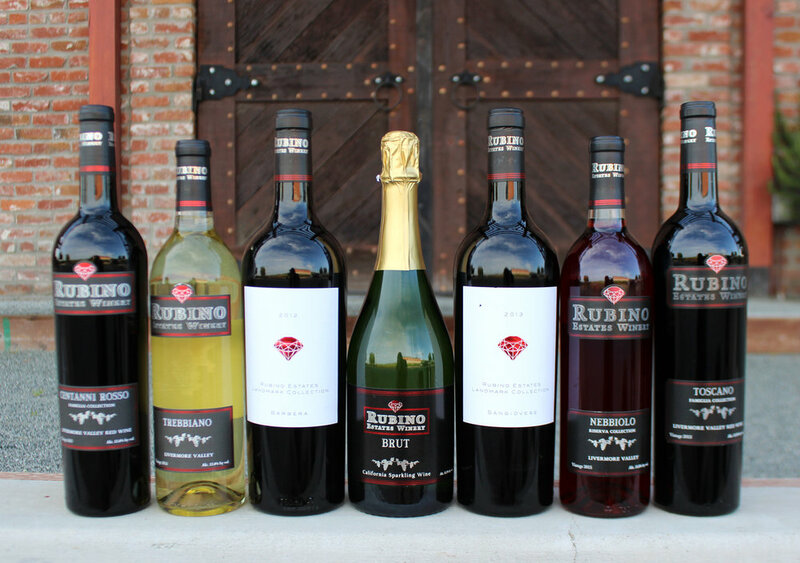 Rubino Estates links grape varietals that are commonly grown in California with the Italian heritage of our vineyards. Our Chardonnay and Cabernet Sauvignon are among the best in the valley. To tap into your inner Italian, we offer a cool and crisp Trebbiano, a spicy Sangiovese and an earthy Barbera. Our club blends feature a fusion of our California and Italian varietals to create complex yet smooth wines. Just over an hour South of Napa Valley, we are best known for our award-winning wines, picturesque views of the Livermore Valley and warm hospitality. Our tasting room boasts an estate bocce court, an Italian inspired Deli, private tasting areas, along with two outdoor picnic areas where you can relax, enjoy your wine and take in the beauty around you. From intimate winemaker dinners, to painting in the Vineyard, to club member release parties, Rubino Estates Winery has an event for you! See what's on the calendar now! Rubino Wine Club membership provides access to limited release wines, discounts on wine and retail, complimentary wine tastings, access to “Club Only” winery events and many other exciting benefits. We have wines for every occasion & palate. Hand-crafted to embrace the fruit essence of our Italian varietals. Purchase a case of our award-winning wine and receive an additional 10% off!